In the last few decades, China has experienced a great flow of internal migra-tion with more than 200 million rural labourers moving into urban area in pursuit of better economic opportunities. At the same time, the number of migrant children increased significantly as they accompany their migrant parents in the cities. Due to China’s special hukou (household registration) system, many migrant children’s basic rights to education are violated despite the fact that they are entitled to the right to education in both domestic law and international conventions. Both central and local governments have adopted policies in tackling the issue over years, yet, it is still difficult for many migrant children to receive quality education. This research investigates the tension between China’s hukou system and children’s rights to education with the city of Beijing as a case study. It analyzes the ways in which committed schools have been challenged to provide quality education for migrant children. 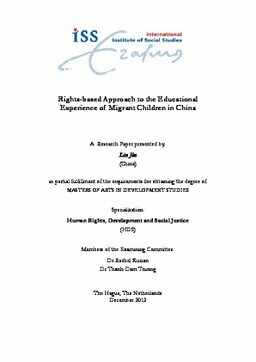 With China being a state party of the United Nations Convention on the Rights of the Child (UNCRC), this research applies the rights-based approach and uses the 4 As framework, which suggests that the right to education should be available, accessible, acceptable and adaptable, as an analytical tool in examining the situation of migrant children’s education in public and private schools in Beijing. In addition, the concept of ‘differential citizenship’ is also introduced as a way of conceptualizing the liminal status of migrant workers and their children—living in the urban area yet cannot enjoy an urban life.